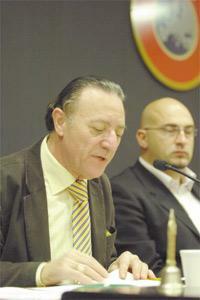 Malta FA president Joe Mifsud. The artificial turf pitch at the Centenary Stadium is set to be replaced in summer and works are expected to be completed by July, in time for the start of the new season, Malta FA president Joe Mifsud told reporters yesterday. Matches from all categories of the national leagues and knockout competitions have been played on the synthetic surface since the stadium's inauguration in August 1999. Now, after almost 500 matches in each of the past seven years or so, it was decided to change the surface to a more modern type of 'grass'. "During the past months we have thoroughly analysed the different types of artificial turf that could be installed at the Centenary Stadium," Dr Mifsud said. "The association held consultation meetings with a Swiss expert and we discussed all options available. Keeping in mind the association's finances, we first shortlisted the different kind of artificial grass that we could adopt and then decided on a FIFA Two Star pitch. "This surface is one of the best in circulation and has been approved by both FIFA and UEFA for international matches. For us it is the best option. The FIFA Two Star surface will give us the opportunity to host UEFA mini-tournaments at the Centenary Stadium. "A new irrigation system will be positioned around the 105m x 60m pitch to ascertain ourselves of a good maintenance system." This season, matches from Division Two and Three will come to a close in the last week of May. Dr Mifsud said works on the Centenary Stadium pitch will commence immediately after. "If everything goes according to plan the new artificial pitch will be available in July," Dr Mifsud said. Another project in the offing is the migration of the organisation's offices from Valletta to the Millennium Stand, Ta' Qali. Dr Mifsud said works on the new location are ongoing and he was hopeful that the inauguration of the new headquarters will be held in June. Yesterday, Dr Mifsud also spoke about the current dispute between the MFA and the three TV stations regarding the broadcasting rights of local football matches. He revealed that talks between the parties concerned were restarted through the insistence of the Malta Broadcasting Authority that is acting as mediator in the case. Dr Mifsud sounded confident that an agreement could be reached soon. "Things look better at the moment," Dr Mifsud said. "We are closing in on an agreement and I hope that it will be finalised soon as the current season is only two months away from its completion."